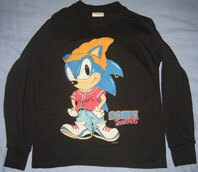 As more classics are discovered, the history of Sonic shirts in the UK spreads to Page 3. 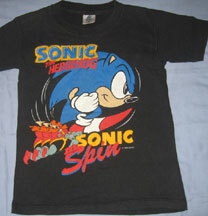 This shirt has a positively giant logo for Sonic 2. What do you do when 3 Sonic games are to be released all in one day? Why, release a shirt, too! This one says "A Hedgehog for all formats", which was indeed true on that day. The games announced are: Sonic CD, Sonic Chaos and Sonic Spinball, all set for Nov. 23rd. The graphic of Sonic is nice too, as it's pretty 3D looking and not the same old image that's been used a zillion times. Photo Credit: Orange Unicorn 1984. 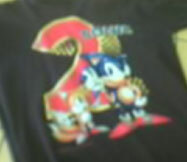 A second shirt for Sonic 2's release. It was also available in the USA. This is a rather cute or clever shirt. 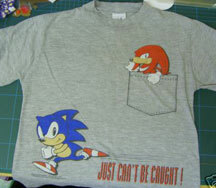 A plain gray shirt has a fake pocket drawn on, and Knuckles is popping out of it! This appeared around the time of Sonic 3 when Knuckles was still really a rival character, so it makes sense to have him 'under cover' in the pocket. He's watching over running stock Sonic and the phrase "Just can't be caught!" which is rather appropriate. With it's rather charming design, this is a good old shirt to collect...if you can find it. This is a very strange tie! Is it official? Is it really from England? All these are a mystery. As you can see the art style is very 'scratchy' and strange. Sonic is climbing a dirt cliff out in space above an island of palm trees in the clouds. There's also another island slapped on above him, and he's 'lit' by strange yellow light. Saturn or a ringed planet appears in the starry sky. With it's odd style and bizzarre composition it comes across as rather tacky...but it is still interesting to see. This tie uses badnik robots for it's design! Jumping up Sonic is among Rollers, caterkillers, bat-bots and Dr. eggman in his egg-o-matic complete with checker-wrecker ball. 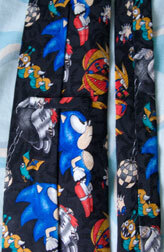 This is clearly a Sonic 1 theme tie, though the color scheme of the robots is changed. (as you recall, caterkiller is purple in the game etc) This is another TieRack tie. 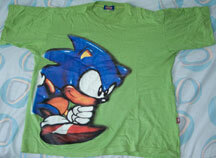 This nice green tee comes from the Segaworld of London. 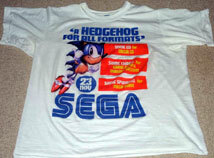 (You can see the Segaworld logo on the tag, if you look closely) Colored shirts (other than black/white/blue) were not that common for Sonic the hedgehog merchandise. 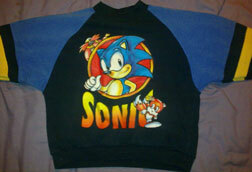 This is a rather cleverly designed classic piece, with a detailed huge running Sonic right on the edge. (he does not wrap to the back) It looks nearly airbrushed, so it isn't a standard stock-art. The likeness is good though, with nothing really off model. The size of the design and positioning make this shirt stylish and edgy for it's time. Great for collectors! Now here's something interesting. This is a varient tie. Varients (color-wise) were not that common with classic items such as this, so it is curious to see. This is a different version of the tie seen on UK Classic Clothes 1, only this one is more subtle and darker. (The other is full of explosions) The artwork here is also positioned differently, revealing more of Tails. Here's an interesting graffiti-theme shirt. This has the somewhat less-common 'gettin ready to go' Sonic stock art placed to look like he's just got done marking up a brick wall. A handbill on the wall says "Robotnik Rules" but a large "NOT!" 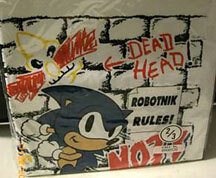 has been scrawled over it, along with a wacky drawing of Robonik's face and the words "Dead Head!". The phrase 'dead head' must be a somewhat UK equivalent of 'loser' while in the USA it's associated with the band, The Grateful Dead, sort of disrupting its impact depending on who sees it. 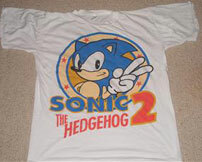 Here's another shirt to celebrate the release of Sonic 2. This one is similar to, but not the same as the above black one. This 2 is instead flat and glossy, not 3D and turned to an edge. 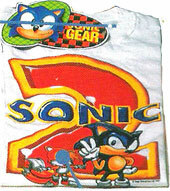 The Sonic and Tails appear the same, but since they've chosen to put their dot *right on Tails' head* (yeah, couldn't of used anywhere else on the shirt, JUST his face) you can't really tell. Still, the design is crisp, bright and on-model. 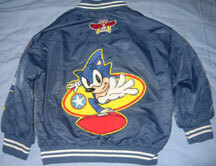 Though he never actually played a sport in a game, Sonic & sports as a theme comes up more often than one might imagine. 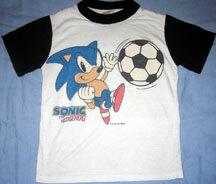 Here he is again with a soccer/football on this black & white tee. The shirt itself gains a sporty look from the black sleeves and collar. Sonic is a somewhat-modified stock art, meant to look like he's kicking the ball. The size of the ball however, makes it a little unclear exactly what's going on though. This classic shirt adds a word and Robotnick to give the rather large design a different look. 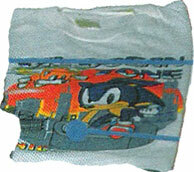 Here is a promotional tee from the release of Sonic & Knuckles.